I live in FL. 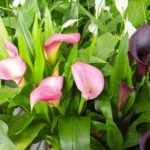 I received a calla lily for Easter. I would like to keep it inside in a pot. Should I transplant it into a larger pot and keep watering it? Or do I just stop watering and let it die down for a while? We have so many plants here that just grow all year round. I don't know what to do with this one.